When does a nation become a nation? The Jewish calendar gives us a date for leaving Egypt and receiving the Torah on Mount Sinai, but not for the arrival in the Land of Israel. Passover is less about the destination than about the journey through the desert—where all that downloaded data was translated into code. And we thought the term “start-up nation” applied only to modern Israel. The onset of nationhood is a recurring question. Theodor Herzl asserted that he created the Jewish state at the First Zionist Congress in 1897. Hayim Nachman Bialik said that Israel would become fully operative when Jewish thieves conducted shady business in Hebrew. When we look at all the history, humor and poetry about the primal cry of nationhood, settling on a simple declaration might seem prosaic—if it weren’t for that 2,000-year gap. Given the deep well of exile, the centuries of wandering, living on the margins of other societies and much worse, it’s not surprising that many Israelis—and many Jews around the world—feel as if every day is Independence Day. On the 5th of Iyar in the secular year 1948 (5708 on the Hebrew calendar), David Ben-Gurion declared Israel’s rebirth as a nation. This year the Hebrew date corresponds with April 19. 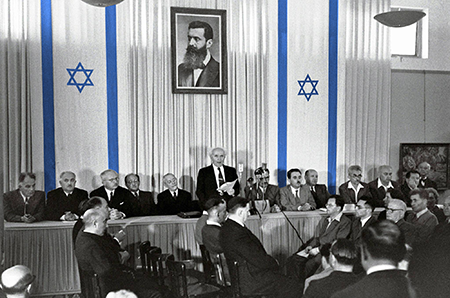 Israel is now 70 years old. This is an occasion to say Shehecheyanu. Seven decades provides a lot of time to establish a new status quo, for people to conclude that things are as they always have been and for wonders to become clichés. But for many of us, the Jewish state’s daily existence, the work and sacrifice that went into building it and the dedication that sustains it, is nothing short of a miracle. Israel revitalized the Jewish people around the world and serves as a beacon—to those people and nations that see the light and those who don’t. Then there is Hadassah’s role. A nation can’t stand on its own until it is medically independent. In the 35 years prior to statehood, Hadassah built Israel’s health care foundations, creating a network of hospitals, clinics, infant-welfare stations and dispensaries across the length and breadth of the land. We bequeathed that network to the new state and have ever since operated the Hadassah Medical Organization as the flagship of Israeli medical care and research. This enormous contribution to the health of the nation belongs to four generations of Hadassah women. Seventy is youthful for a country but well into maturity for people. And yet, Hadassah has countless examples of volunteers working well beyond twilight. Our founder, Henrietta Szold, was 73 when she accepted responsibility for Youth Aliyah, the movement to rescue Jewish youth from Nazi-dominated Europe; the program ultimately became a pillar of Israel’s education of immigrant and at-risk students. Just as no single moment defines the start of a nation, the work of a society is never complete. Israel is arguably the most successful of the 100-plus countries that have gained independence since World War II. And yet, we all know there is still work to do, foremost achieving peace between Israel and its neighbors. 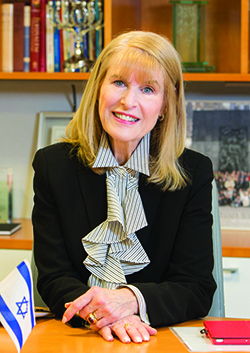 As proud as I am of Hadassah’s accomplishments in medicine, I am just as proud of the example our hospitals set in relations between Arab and Jewish patients and medical professionals. A start-up enterprise encourages participants to restart themselves. If you, or someone you know, isn’t a partner in Israel’s development through membership in Hadassah, it’s never too late, and you’re never too young or old, to get involved. If you’re anything like me, you’ll always remember the day you began to build a nation.